I have bought ten balls of this colorway, so I have to knit a lot more socks. 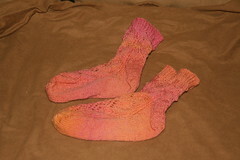 These ones are made with the pattern rose cottage. Took longer to knit than the temptation toe-down socks, but not nearly as boring than the other socks.